While I could consider this past summer a failure in the garden, for several reasons, one reason why it will go do down in history as one of the best growing seasons is because one of my Adenium Obesums was in bloom. 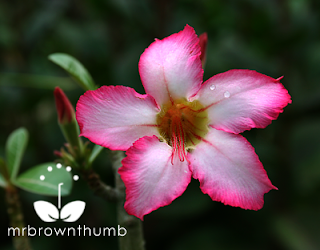 It only had three blooms, but this pink Adenium Obesum flower was my favorite flower in the garden. The day I spotted it blooming I took it off of the deck garden and placed it in the garden among all of the perennials and annuals, as if it to say to them; "This is how it is done." I wonder if my plants get WiFi in the garden, because I could swear that this Adenium only decided to bloom after I posted about the Adenium Obesum flowers and seed pods I spotted at the Garfield Park Conservatory here in Chicago. Whatever the reason it got into blooming mood I'm grateful. 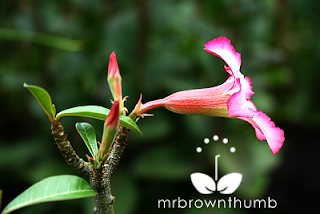 Here is a photo of my pink Adenium Obesum bloom. This is what the bloom's profile looks like. As you can see the flowers of Adeniums are salverform, they are tubular and outer edge spreads out flat. Here is a full shot of my Adenium. I have mine planted in a terracotta pot because Adeniums need good drainage and the unglazed terracotta pot helps them to dry out between waterings. 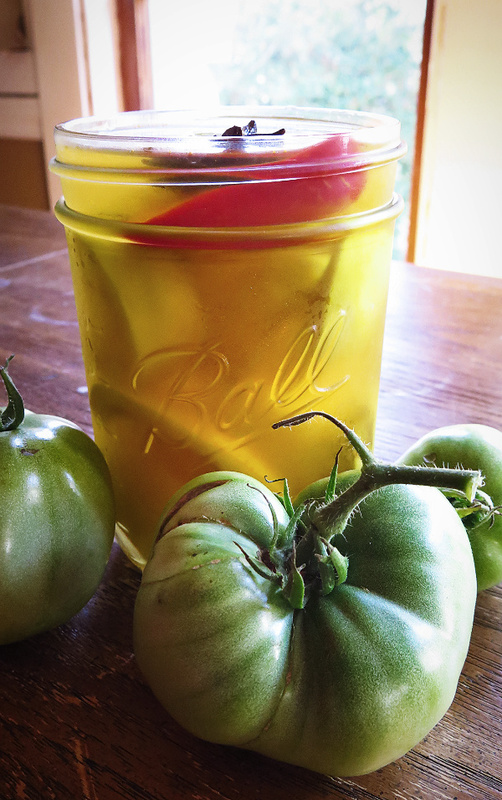 The other two blooms you see on the stem never got a chance to open, they were accidentally knocked off of the plant. Pretty! I haven't had mine long enough to see it bloom (other than the day I bought it) but I have high hopes. I need to move it to a terra cotta pot... mine's still in its original plastic (I'm lazy). Also nice to know it survives with few leaves! Very lovely flowers. I'm exited that my Adenium arabicum seedlings have begun growing again. After the initial transplant they stopped growing for about two months. I was extremely worried and they even got attacked by mites, but everything seems on track now. Wow! Another gorgeous tropical I know nothing about. Beautiful! I'm trying to comment using my WordPress url Mr. BT, but I'm havin a little trouble. What a cool, architectural plant it is - interesting even when not blooming. I can see why you were excited about the bloom - it's beautiful. Why have I not invested in any of these succulent broadly caudexed plants??? LOL. I have no idea. They do exceedingly well here in south Florida. Maybe I will ask Santa for one! The blooms are so pretty!!! Congrats!!! I think you can see the way the plant looked when I originally got in a previous post. It has lost most of the leaves during the past couple of winter dormancies and they just won't grow back. Seems to be doing ok, other than that. When I grew my first one from seed I remember the transplant shock was annoying. They wouldn't grow, but they wouldn't die either. Glad yours are doing better. Glad you figured out how to comment with the new blog. You should grow one of these little guys. I know this one doesn't look as impressive as the ones that grow in your area so thanks for the compliment. This is the same kind of plant I was drooling over at the show. I so wish I could've bought some then. I don't know why? They must be especially cheap in FLA. I got mine at Wal-Mart or Home Depot garden centers and they were all less than $5.00. You should get some. 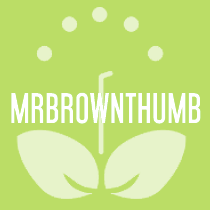 Hi Mr. Brown Thumb! I've never seen such a plant. It's a very pretty flower... but is this a bulb of some sort? I'll have to do a little research. :-) Have a wonderful Christmas!!! Oh, just another plant that I need to add to my collection of things I can't live without! LOL. I need a conservatory. It's gorgeous, MBT! I'm glad it flowered for you. You'll hate this, but ... I picked one up from a trash heap yesterday! It's amazing what people throw out. Adeniums love South Florida's climate with hot, wet summers and cool, dry winters. I keep mine in pots so I can move them around, but they're perfectly happy in the ground in a sunny spot. Hope you had a wonderful Christmas and that 2010 is off to a great start. Look around the big box stores if you go there and you just may run into one. You should add it or at least to a list. But be careful with your cats because the sap can be an irritant. That is crazy. I was just commenting on the YouGrowGirl.com blog who is on vacation in the Caribbean. She posted pics of some huge air plants just laying around on the ground and I commented that there is probably $40.00 just laying there on the ground. Are you still posting about desert roses? 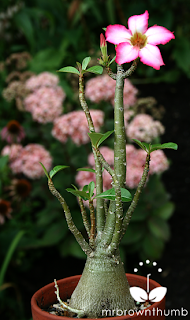 I clicked on adenium obesum in the label cloud and it looks like the more recent post was in 2009! I just purchased some seeds on eBay and am determined to succeed. I am successful with my phalaenopsis orchids so will do my utmost best with the adenium.